The theatrical, the satirical and the macabre come together in arresting fashion in the art of James Ensor. Curated by Luc Tuymans, this exhibition will present a truly original body of work, seen through the eyes of one of today’s leading painters. 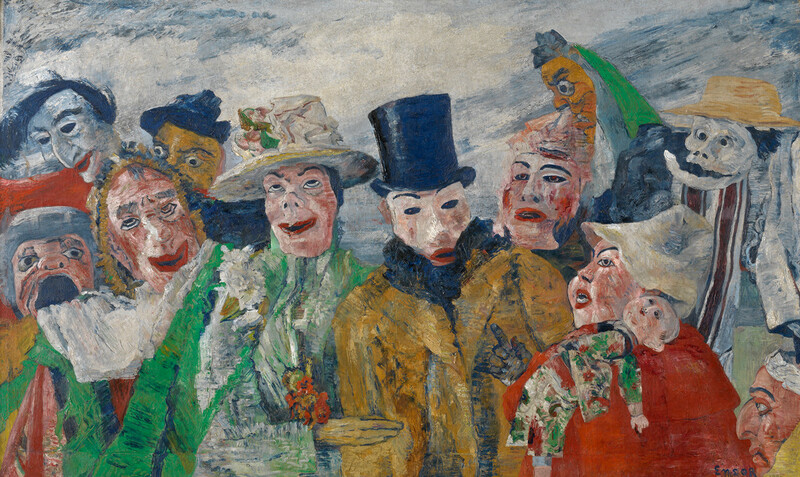 Despite spending his whole professional life in the Belgian seaside town of Ostend, James Ensor was very successful in his lifetime and exerted considerable influence on the development of Expressionism. An innovator and an outsider, he rebelled against the conservative art teachings of the late 19th century academy in Brussels, drawn instead to the avant-garde salons where his radical creative vision could thrive. Ensor’s childhood spent among the fantastical treasures of his family’s curiosity shop offers a clue as to how the seeds of this wild imagination were sown. The imagery of masks and carnivals runs through much of his work, from vibrant colours and flamboyant costumes to an ever-present sense of drama and satire. We have invited the artist Luc Tuymans, a fellow Belgian and admirer of Ensor, to curate this unique exhibition. Taking a personal view, Tuymans will look back at Ensor’s singular career through a selection of his most bizarrely brilliant and gloriously surreal creations.